Next on The Scoop: Cat Adoption Checklist: Are You Really Ready for Cat Adoption? Sometimes, it seems like cats just want to eat whatever food isn’t theirs — from the food that’s on your plate to the food that’s in your dog’s bowl. Obviously, you want your cat to eat his own food, but can cats eat dog food? And is it dangerous if your cat eats dog food? Can cats eat dog food? Is it safe? Can cats eat dog food? Photography © fotoedu | iStock / Getty Images Plus. 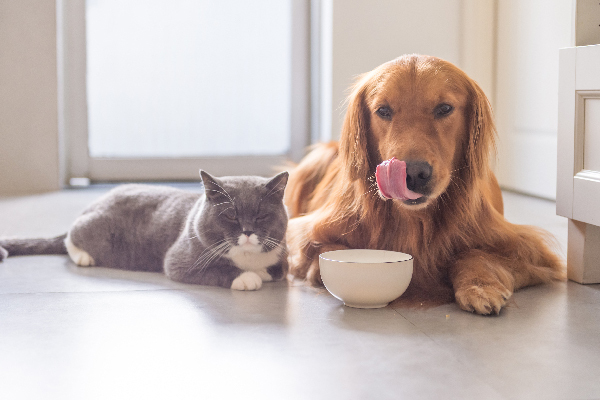 According to Emmy award-winning vet Dr. Jeff Werber, the good news about the question, “Can cats eat dog food?” is that if your cat eats dog food it’s not dangerous. Dr. Werber explains that while your cat won’t be immediately injured or made sick by eating dog food, it isn’t necessarily healthy for him. 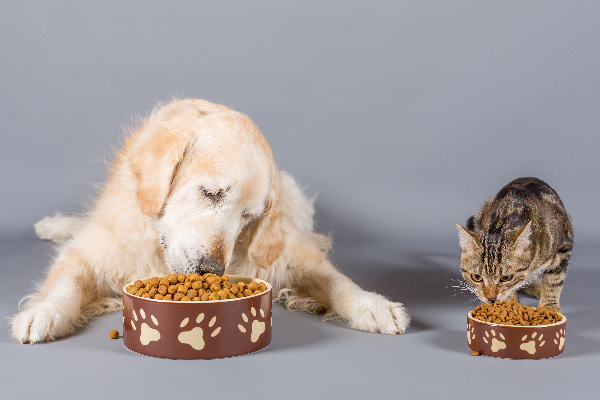 What are the differences between cat food and dog food? The next question you may have after, “Can cats eat dog food?” is “What’s the difference between cat and dog food (beyond the size of the kibble)?” It’s really about the protein levels. “Cats can’t live on dog food, as it doesn’t meet their needs for protein,” Dr. Werber says. He explains that the protein content in dog food is significantly less than the amount of protein that is included in commercial cat food diets and the level of protein that cats need. Can cats eat dog food — if it’s an emergency? Sometimes, even the most responsible cat parents run out of cat food. You thought you had more cat food than you did, and it’s the middle of the night so the pet store is closed, a freak snowstorm hits and you can’t get to the store, etc. So, can cats eat dog food if it’s an emergency? Dr. Werber explains that dog food is not inherently dangerous for cats and that ultimately, “it will not hurt a cat if he eats dog food,” Dr Werber says. So, in case of emergency it’s OK to give your cat dog food for one meal (assuming that your cat doesn’t have any other underlying health conditions or allergies). However, it’s not advisable that you feed your cat dog food on a regular basis. Another question that pops up when thinking, “Can cats eat dog food?” — how do you keep your cat from eating his four-legged sibling’s dog food? One of the consistent challenges of living in a multi-pet household involves pets trying to eat each other’s food. I share my life with three cats and three dogs, and each of mine have different diets including prescription foods, so keeping them out of each other’s food is a must! Feed your cats and dogs two or three meals a day (depending on advice from your veterinarian) instead of free feeding (keeping food available at all times), unless there is a medical reason your veterinarian wants your cat or dog to consistently have food available. Feed your cats and dogs in consistent places for each meal. Create a feeding routine, and reward your dogs and cats for eating their own meals. Set your cats and dogs up for success by physically preventing them from getting into each other’s food. This further ensures that they only consume food that meets their nutritional needs. This also supports positive and safe interspecies relationships between your pets and may prevent any kind of resource guarding if your cats and dogs aren’t worried that their food will be taken by a sibling. To create physical separation, feed your cat on a cat tree or other raised location, which will keep dogs away from the cat food. Or, put different pets in different rooms (behind doors or baby gates) when meal time rolls around. Thumbnail: Photography © chendongshan | iStock / Getty Images Plus. Feed in separate locations – ah yeah, that just makes common sense.